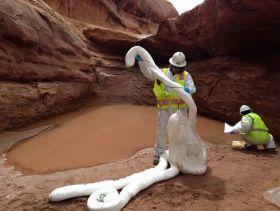 Cleanup crews with absorbent boom at Salt Wash, just east of Labyrinth Canyon. Vacuum trucks removed some of the petroleum-tainted water. Boom is set out on the water's surface to grab petroleum that spewed into Salt Wash after a well casing failed last week. A cleanup is still underway nearly a week after authorities learned that an oil well was spewing contaminated water near the Green River. Over the weekend, the petroleum reached the river, and now some observers want to focus on preventing future accidents. Beth Ransel, who oversees the Moab office of the U.S. Bureau of Land Management, points out that emergency crews plugged the high-powered leak from an old oil well Thursday. But she explains they were only partly successful in containing the damage. She says the contaminated water traveled down the 3-mile Salt Wash and into the Green River, but no one knows how much. She’s pleased with the efforts of the state and federal agencies, the company that owns the well and its cleanup contractors. 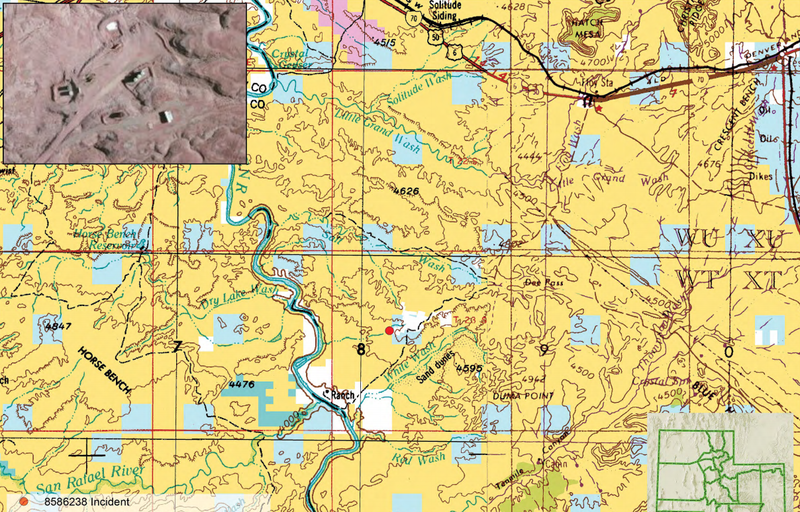 red dot on this map shows the location of the well that failed last weekend and spilled a water-petroleum mix. Despite containment ponds and absorbent boom, the contaminated water reached the Green River 3 miles away over the weekend. But Steve Bloch of the Southern Utah Wilderness Alliance says this latest spill should be raising red flags. “We think this should be a cautionary tale for the BLM and for other land management agencies like the School Trust Land Administration,” he says. Bloch describes last week’s leak as the kind of accident that could have been predicted, since many of the wells in Utah are getting old. Bloch would also like to see the land agencies check other wells that might be in danger of failing that are located in popular recreation areas or environmentally important places. BLM officials say the agency was up-to-date on the inspections at the leaky well, which is south of Green River City and near the put in for rafters and canoe paddlers headed into Labyrinth Canyon. A protest in Utah’s San Juan County ended without violence on Saturday. But the conflict between a federal government agency and its critics is expected to continue. San Juan County Commissioner Phil Lyman organized the ride into Recapture Canyon, where the U.S. Bureau of Land Management banned motorized vehicles 7 years ago. Lyman urged protesters at a morning rally on Saturday to steer clear of the closed areas because of the risk to the archaeology and to their reputations.